Hey guys, I've been reading over the forum posts trying to soak up as much information as possible, but I've still got a few questions. Came across a "deal" on ebay on an MTH PS1 Camelback. It was supposedly missing some "boards" and a few other things. After a bit of research, I figured I could replace the missing electronics with an ERR DC commander and at least get it running again. Wasn't very familiar with modern train electronics previously, but I've (hopefully) learned a lot in a short time. The motor's in there, but obviously doesn't run at the moment. From what I can figure out, the engine had a 4 pin tether to the tender. The outer wires hook to the yellow and white ones on the motor, so I'm assuming these would go to the DC motor out wires on the DC commander. The inner ones show AC voltage, so I'm assuming one of these come from the center rail pickup rollers on the engine, and would go via tether back to the tender, and there also hook up to the DC commander board. Everything else in the engine (smoke unit, lights) seems to be wired to the AC, so it looks like the 4 wire tether will do just fine in this case. While there's a speaker in the tender, and a volume pot, there's no other sound equipment anymore. I assume at a later date if all goes well, I can add an ERR Railsounds commander board if I want sound. There's also an electric coupler on the tender. This should work hooked up to the DC commander, right? It sounds like the DC commander can be used with either TMCC or conventional, but after reading the manual, it isn't clear how to switch between them. There's a program/run switch, but nothing to switch between TMCC and conventional. Anyone know how this works? Antenna location is going to be another issue with the die-cast tender, but I'll cross that bridge when I come to it. It will decide which mode to use automatically, set it to run as programing is used for setting cmd. perameters. I forget if it is by the signal or the low voltage aspect of conventional that it decides what it uses. You could also use a rectifier or diodes to run it FWD (or rev) only if you wanted to. A 9v battery could likely test the motor if there was no weight on the weels. The DC commander should work fine but this board does not have cruise control. If you get the Cruise Commander instead, you will get cruise control (the board does cost 40 more). Both boards control lights, couplers, and smoke. 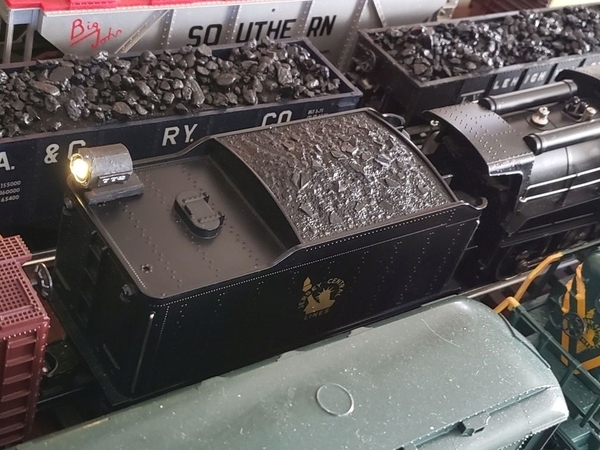 I do not know much about MTH smoke units so I do not know if anything extra needs to be done to connect it to either board. Either board works on both conventional or command. The board will auto detect the command signal when it powers up. If the Legacy/TMCC command base is on, powering up the engine it will go into command mode. If the command base is off, the engine will power up in conventional mode. The program run switch is used to program the engine so it knows its ID and feature set. I realize this (and if we still had a radio shack locally I might have gone the rectifier route, at least temporarily), but by the time I tossed in an electronic E-unit to run it conventionally with reversing capabilities, I'd be over halfway to an ERR DC commander anyway, so figured it was the best route. Testing with a 9v battery sounds like a great idea, and I'll probably give that a try tonight! I contemplated the Cruise Commander, but since I don't actually have a static layout, and it'll rarely be ran with any other trains, the added cruise capability didn't add anything for me to justify the additional cost. I can certainly understand its appeal under other operating circumstances. The smoke unit seems to be wired in to the AC wiring in the engine, and has an on/off switch underneath the cab edge, so I'm assuming there's no need to actually wire it to the DC commander as long as I don't want to control it remotely (saving running an extra pair of wires back to the tender). That's really neat that it'll automatically configure between command/conventional. At the moment, I don't have a command base hooked up to my "test track", but do have one and will probably use it when I set the trains up for Christmas. I do need to see if I can source a replacement "backup light" for the tender, as it was one of the items that was missing when I got it. You knowing was my only concern. It's more of a temp. fix unless you are a looper. Better in a long range train vs a camelback too. Another idea; add a switch to a motor lead so you could keep it on a shelf and power it up for lights, sound, etc. without fear of a sudden "launch" if it changes modes unexpectedly. You wouldn't be the first, and imo, a camelback is interesting enough to always be shelf worthy. All of these are geared like "toy trains" (fast!) That little motor isn't very powerful. The longish wheelbase and rubber tires on both sides of the axle mean a rapid increase in friction when entering home layout-sized curves. You will notice binding and slowing on anything less than about O54, especially if you're running the loco alone without a train. Bottom line- yes "cruise control" is a gimmick and a band-aid, but it's kind of necessary to give these locos smooth performance at slower speeds. Get the Cruise Commander. My $.02. The additional cost of a Cruise Commander will be long forgotten once you experience the pure pleasure of running with cruise control. Magicland, I just upgraded an MTH Daylight to the DC Cruise Commander. Everything in the MTH engine (as long as it's a Proto 1 engine) will work with the ERR board. If your interested, here's a link to my mod of the Daylight. I've never had any issue with 036 Fastrack as to engine speed vs throttle position, but when pulling an easy grade, I needed Cruise Control. Okay, finally got in the tether that I ordered (one of the several things missing when I got it), so it was off to the races to install the board tonight. Knew the motor worked thanks to Adriatic's 9v battery suggestion above, and the rest was fairly simple. 4 wires off the tether, 2 for the program/run switch, hook on the antenna (which will eventually present a bigger issue, as the entire tender shell is die cast, but that's a problem for another day), biggest issue was finding a connector that'd fit to wire the tender coupler to the board. Powered up, twisted the knob on the Cab 1, and off she went. In reverse, of course, but that was a simple enough fix. Salvage operation (phase 1) complete! As I mentioned, permanently mounting the antenna will be a challenge. It's probably either isolate the body (anyone know a good source for nylon screws? ), or dremel off the cast coal load and replace it with an actual one (with the antenna mounted below). The (original MTH) electric coupler on the back of the tender, does polarity matter (both wires from it were black)? And can in only be triggered in TMCC mode? Thanks for all the help and suggestions so far, guys! No polarity for couplers and yes, you need to be running in command mode to have access to the coupler operation for TMCC. Now I still need to find a source to replace the backup light for the tender. Anyone know what voltage, and if AC or DC (I'm assuming DC) the front and rear lamp outputs from the DC Commander board are? I only need the rear (the front headlight is still wired to the original engine wiring). Also, since there are 2 different outputs, I assume this lighting is directional? Prototypically, if the backup light was in use, would the front headlight be turned off, or just the backup light turned on when moving in reverse? The lamp outputs from most TMCC stuff, including anything that uses the R2LC or R4LC are half-wave track power in command mode and full-wave track power in conventional mode. Typically, for incandescent bulbs, a 12-14V bulb is used. If you want to use an LED, a series 470 ohm resistor is a good choice. The headlight on the steamer should be on all the time, the tender reverse light comes on in reverse. That is accomplished by using the AUX1/4 configuration code, steamer with smoke. I think I'm going to go the LED route, and just make my own housing for it. From the pictures of units with the backup light in place, it appears identical to the front headlight, and is basically a cylinder with number boards (non-lighted) on the sides, and a clear "lens" on the front. Well, since you can have either option with programming the R2LC properly, there's no reason to use track power directly. Program it like a diesel and the lights will be directional, program it like a steamer and the front light will remain on all the time. If you're controlling the lights through the R2LC, you can also use AUX2 to toggle them on and off. Here's the grab-bag of Kapton tape, four rolls of different sizes, each 36 yards of tape. Hxtape Multi Size Choices High Temperature Kapton Tape,Polyimide Film Tape, $11.15 shipped free. You can have it tomorrow if you order quick. That sounds like a great deal. Not sure if I'd EVER use it all. It takes me several years to go through a 36 yard roll, I typically keep the 3/8 and 3/4 sizes around. Haven't gotten the tape yet (did save it in my Amazon wish list), any idea if it'll work taped to the tender bottom? Have to dig out the base and give it a try. 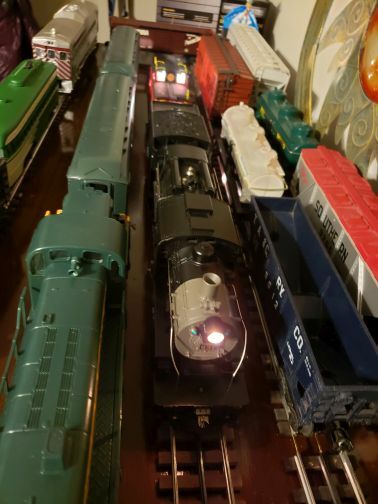 Making progress with the light, still a bit of work to do, but it's working (accidentally put the Lionel running number on it instead of the MTH, have to switch that). If you're talking about the antenna, taping it to the bottom of the tender is a very poor location, it probably will not work well, if at all. Float the tender shell, that's the most effective way. Guess i'll have to track down some nylon screws that fit an MTH tender. And now that I've actually got it up and running, I guess it's time to consider throwing in a railsounds commander too. I see the steam comes in small, medium and large, would medium be the appropriate one for a camelback? Probably medium or small, it's really your choice. The screws are #6-32, Digikey has them. I buy the longer ones as I can simply snip them to length for any application. What is your source for tether wires? ERR used to carry along with elctro couplers. Also Lionel or MTH carries elctro does anyone have part #s.
I use MTH tethers for my builds. Lionel has tons of different styles of electrocouplers. Great, thanks, wasn't sure what size they were. I'll have to look and see if they have anything else I can use... Wish 3rd Rail had samples of what the different sounds sound like. Never heard a camelback in real life to compare though, but in my mind, at least, with 6 drivers, that'd put it in the "medium" category, even if on the smaller side. Go to ERR's website (ERR by 3rd Rail) , Then to "Shop Now", Scroll down, And then listen to the sound samples on the Cloud. I'd imagine it'd depend on how many wires you want in your tether. I went with an MTH BC-0000028 (4 pin, since that's what was already in the engine and was all I needed), if you need 10, BC-1000002. Both of those are with the angled ends. I got mine from Brasseur (traindoctor.com). You can get either straight or angle tethers in 10-pin configuration from MTH. You can also get matching engine 10-pin connector boards. Great, thanks! I'd just looked on the Railsound Commander page, didn't think of going to "shop now"!